Let’s be honest, many musicians struggle with songwriting. Weak melodies, cheesy cliches, and thoughts that ramble throughout the song are only a few of the problems you face. Yet, you see other musicians churning out hit after hit. What do they have that you don’t? Is it simply that they’re more talented? Maybe… and maybe not. It could just be that they have a method to their songwriting, a formula that streamlines their creative process, clears out the roadblocks, and lets them maximize their talent. Here at Source, we’ve heard your frustration concerning songwriting, and we decided to do something about it. We commissioned award-winning, chart-topping songwriter Cliff Goldmacher to write a guidebook about the method and the madness of songwriting. Cliff’s songs have spent months on top of the Billboard charts. He teaches workshops for BMI and ASCAP and is a member of practically every songwriting guild and association out there. 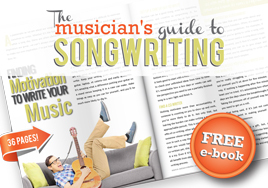 Best of all, this comprehensive songwriting manual is a gift for YOU. That’s right, it’s free.